A teacher in Japan has used inspiration from the My Hero Academia series to encourage students who are struggling hard at one of the most anticipated events for students each year, namely sports days or school sports festivals. For those of you who don't know, sports day is the day when children in school compete in various physical activities such as running, baton pass, three-legged race, tug of war, and more. Teams are usually divided between classes, and competition can be very fierce! To inspire their own class, this teacher drew Midoriya, the protagonist of My Hero Academia, to cheer up their class students with the words: "We will go to victory!" 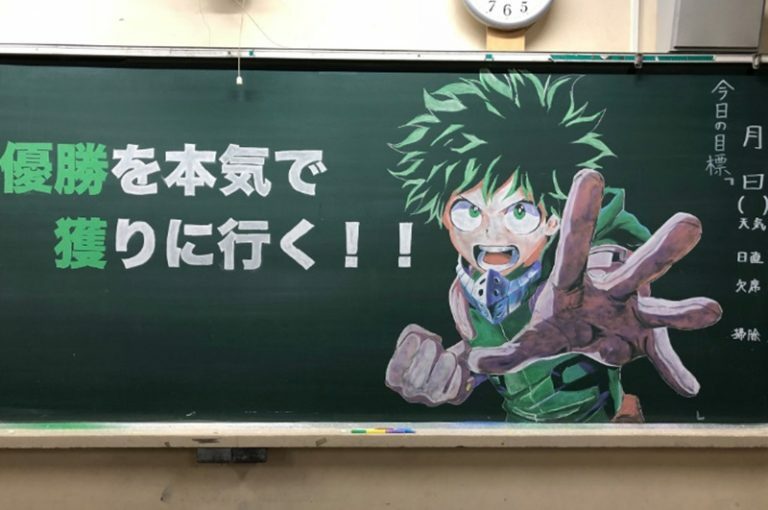 Amazingly this teacher only uses 6 types of chalk to draw Midoriya. Apparently the previous years, he did the same thing with different captions and images. Here is a summary. "Everyone, let's collar all power! Red Team Wins !! " "Green Team, take it to the top position!" "The Blue Team's counterattack starts now." And win in our hands! " "I want to buy the blackboard." "The picture is good, but the words are just as good." "Can you be my teacher?" "I don't want to be the child assigned to delete it." "I think the class has won."